In part one it's all about preparing the background of your journal in a quick and easy way. In part two it's all about embellishing pages with collage and other items. In part three we will delve into the whats and hows of writing to finish up the pages. I hope you will enjoy this tutorial. If you have any questions please ask them in the comment section so others can learn from it too. If anything is not clear in the instructions or just doesn't make sense, please let me know. Sometimes things that speak for themselves to me can be completely new to somebody else and I want this tutorial to be clear and instructive. So any feedback on how to improve it is welcome. Thank you. Something to journal on that's made of paper. An old book, a composition book, a blank book, a fancy journal, a sketchbook. I believe you can journal on just about any kind of paper. I have had all kinds of journals in my life and they all worked fine. Gesso. Make sure your gesso is not of the gritty kind. I have a very smooth one without any grains in it. A gritty gesso will ruin all your pens, except maybe brush pens. Brushes of a reasonable size. There's no need for detailed brushwork in this tutorial. We're painting big surfaces and doing it fast. Water. For diluting the paint and cleaning your brushes. Acrylic paint that is not diluted will become sticky and you don't want your journal pages sticking together. Paint. In this tutorial I'm using regular acrylic paint. You can also use watercolor or gouache. The effect will be a little different and watercolor will not be waterproof afterwards. That does not matter for the things I do in my journal, but it might matter to you, so keep that in mind. A blow dryer. This one is optional, but I can't live without one when I'm using paint. It so helps with the drying time. An old credit card, bank card or anything card like. This is used for one of the background techniques I want to show you. 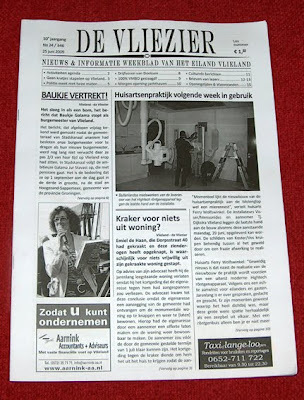 It's a little local newspaper that's printed on ordinary copy paper. 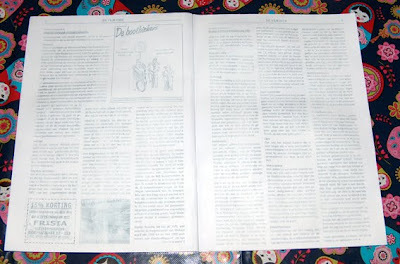 It's stapled in the middle to hold the pages together and measures about 21x30 cm (A4 size). This will make a nice little 16 page journal for our tutorial. I know it's hard to believe right now, but stick with me and I'll prove it to you. ;-) The preprinted pages will give an extra effect to the final pages, but it's not necessary to have preprinted pages, a blank journal will do just fine. Just go with what you like. 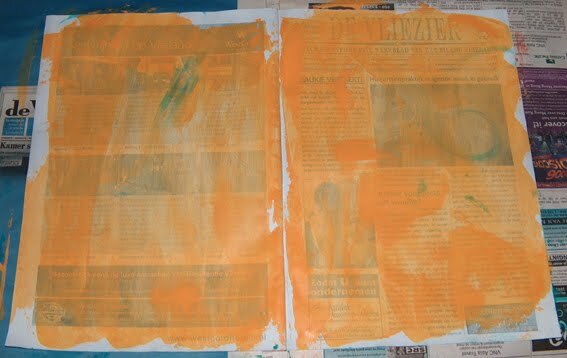 Before we can make things pretty we have to make the paper suitable for all the media it will be covered with. This is where gesso comes in. Gesso is like the great equalizer. It can make all kinds of paper ready for mixed media use. Gesso is an artist's best friend. All you have to do is cover every page in it. Make sure the gesso is dry before you turn a page or they will stick together and you will tear them. See, this is where a hair blow dryer is essential! ;-) Here's how one spread in my journal looked after gessoing it. As you can tell, you can still see the print underneath, but it's become a lot more vague. 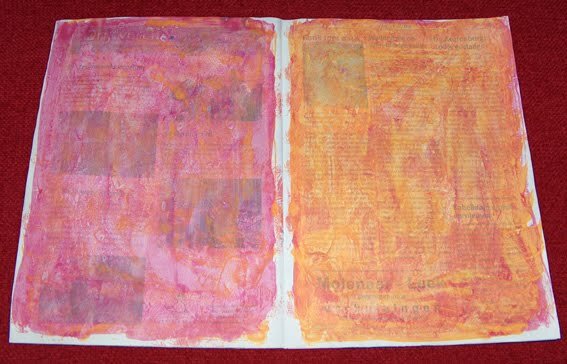 If you use an old book or other printed matter and don't want anything to show through, what you can do is add more layers of gesso. I however want some things to show through for the extra effect. When the gesso is dry it's time for some color! I will show you two basic quicky techniques that will give you room to play with paint and make colorful backgrounds. Time to get your paints! I only used four different colors on my easy peasy journal. You can go with many more, but I'm sure only two colors would work too. Don't think you need loads and loads of different colors. Just pick a couple that you really like. You don't even need to mix them. This is a very good technique if you like a very smooth background.Take your old credit card or similar kind of card and put a dab of paint on your surface. You don't need to dilute your paint with water for this technique by the way. 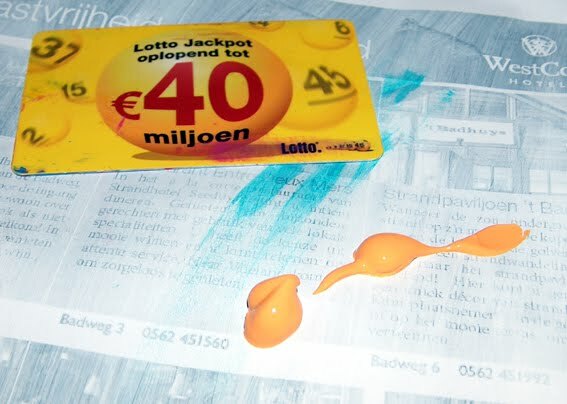 No matter how many layers you put on, the page will still feel smooth, as long as you make sure to really spread out the paint with the card. Don't cover every part of the color underneath, but try to make patterns or groups of color. 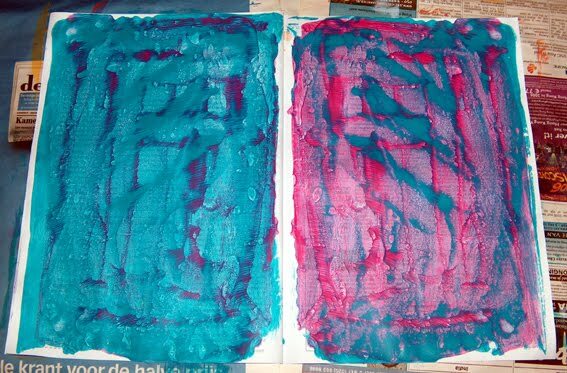 Experiment with different colors on top of each other. This technique alone could make you fill tons of books with backgrounds that all look different from each other. Play with it and see what happens and how many different ones you can make. On this one I first put different colors on the top and bottom of the spread and then went over them with other colors to pul the pages together. This technique is so simple and makes for such pretty backgrounds that I cannot believe I did not think of it years earlier. This time you do need your water and a big brush. Dab a little paint on each page. In this case I chose one color for the left side and a different one for the right. 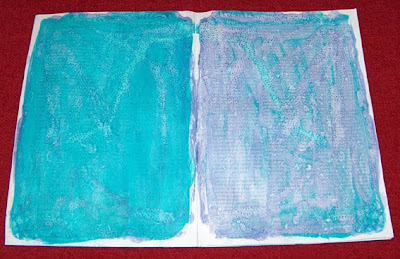 Now really wet your paintbrush and with your wet brush divide the paint over the pages. One color on each side in this case. Make sure the pages are really wet. 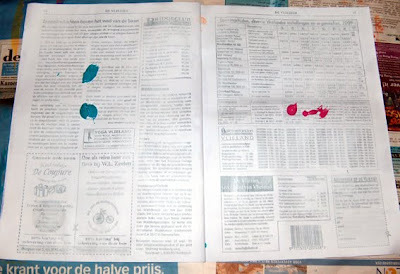 If you don't the paint will dry too fast and your pages will stick together and tear during the next phase. Make sure you act reasonably quick now. Close the pages onto one another and rub them together. Then take them apart again. Presto! Not only will the colors rub off on each other, but the surface gets these really cool patterns that remind me of the crater landscape of the moon. The photo above doesn't really do it justice I'm afraid. The surface is not as smooth as with the credit card technique, but still smoot enough to write over, because you rub the pages together. You can put variety in this technique by using more colors or by dividing the colors differently over the spread. You could for instance put one color on top and another on the bottom or make rough figures with your paintbrush before closing the pages. Again this is a matter of experimenting. It's a fun and quick technique to make different kinds of pages. I've come to use it a lot. Both these spreads were done pretty much the same as the one above, but as you can see color use already makes a huge difference. Well, those were the two techniques I wanted to show you. As you see, nothing fancy necessary. Just slap some color on those pages and you're good to go for the next stage which we'll tackle next week. You might want to get some old (or new) magazines for that one, because we will be doing a little collage and embellishing the pages. Hope you enjoyed this first part of the tutorial. The next one will be up next Friday and the third and last one the Friday after that. I look forward to your responses and hope you got some ideas to prepare your pages. I hope you will join me for part two next week! For now I wish you all a very artsy weekend! 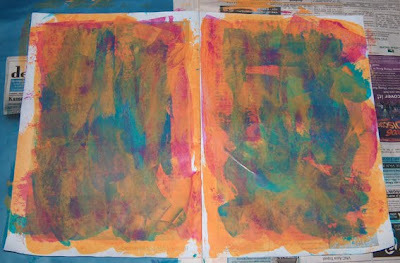 This is a terrific helping hand for those who want to get started with art journaling. AWESOME job Caatje! Thanks so much for the obvious time and effort you put into explaining and showing us your techniques. I think it was very clear and definitely easy peasy. 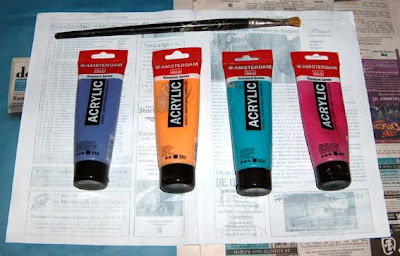 I'm looking forward playing with paint...and to next week! That is an excellent tutorial for those who are new to art journaling or even to those who just need a new idea or inspiration to get going again! Thanks for sharing that! Great tutorial, Caatje! You explain everything so clearly, and take a nice easy pace. 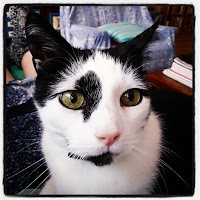 Your photos support everything you are telling us about. Nicely done! I am looking forward to seeing the rest! Nice job. Love doing backgrounds! Wat een duidelijke en leuke tutorial Caatje! Je hebt er veel werk aan gehad (ik weet hoeveel tijd er in dit soort dingen gaat zitten!) en alles prachtig en duidelijk geillustreerd. Hier zullen heel veel mensen plezier van hebben!!! Wat ziet het er weer mooi uit allemaal Caatje! Made some easy-peasy backgrounds today the way you described here. Great tutorial! And it really just can't go wrong, always nice results, love it! Lovely and wonderful tutorial. It is too late for today - but tomorrow I will at once colour some pages. An old book is already waiting. Jouw tutorial gaf me net dat laatste zetje om eindelijk acrylverf to proberen! Dank je wel voor de goede uitleg. Natuurlijk heb ik in mijn blogpost een link naar jouw blog gezet. 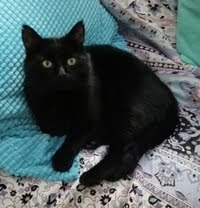 Hi Caatje, dank voor de ideeen!! 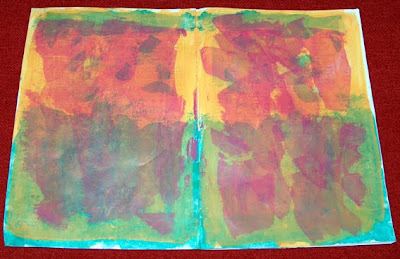 Ik wil al enige tijd een art journal beginnen, maar kan hier in Tanzania geen (mooi) sketchbook vinden. Nu weet ik dat je er van alles voor kunt gebruiken! Thanks!! Je kunt het ook zonder gesso hoor, gewoon direct verf op de pagina's smeren. Ik gebruik de gesso vooral om de onderlaag stevigheid te geven en de teksten enzo wat meer te verbergen. Gesso is een soort grondverf waarmee je verschillende mateiralen (hout, canvas, papier) geschikt maakt voor verf. De standaard is wit, maar er is ook gekleurde en zwarte en kleurloze gesso. 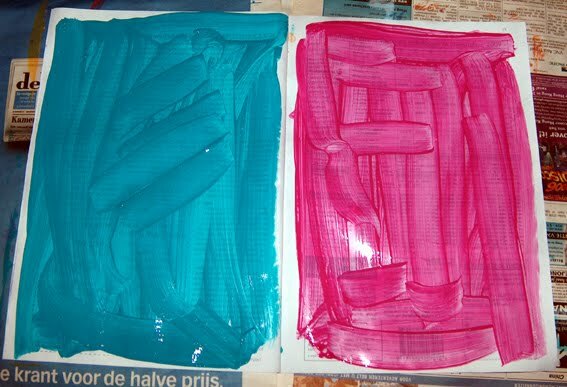 Gesso kun je ook gebruiken om structuren aan te brengen en je kunt het mengen met verf of wateroplosbare materialen om een soort krijtachtige kleuren te krijgen. Zorg als je gesso koopt dat je er een hebt die niet korrelig maar glad is. Korrelige gesso geeft meer grip voor verf enzo, maar is funest voor je pennen en in een journal heb je die grip niet zo nodig. Ik weet niet welke merken je kunt krijgen waar je woont (wat ver! ), maar mijn favorieten zijn Talens en Golden. Hier is een link naar een factsheet van Golden over hun gesso http://www.goldenpaints.com/technicaldata/gesso.php. Ik zou echter als ik jou was even kijken op youtube en via google naar wat je allemaal met gesso kunt en zien of je het echt nodig hebt voor wat je wilt. Succes!